Bishops' conferences from five countries called on Catholics, politicians and society at large to confront the issues causing a flow of unaccompanied minors from Central America—and to tend to them as they travel through Mexico and arrive at the U.S. border. "Bishops and their workers reiterate the urgency of the respecting human dignity of the undocumented migrants, strengthening governmental institutions ... firmly combating the reprehensible activity of illegal groups and organized crime ... and investing in Central America," the bishops' conferences of El Salvador, Honduras, Guatemala, Mexico and the United States said in a July 10 statement. "We call on business leaders, especially Catholics, to invest and contribute to the promotion of justice and equality. We exhort parents to not expose their children to the dangers of the dangerous journey toward Mexico and the United States. And we ask society to in general to assume their rightful roles." The arrival of so many unaccompanied children has overwhelmed U.S. agencies, which were unprepared for such an influx. The U.S. Customs and Border Patrol has detained more than 57,000 unaccompanied children since the fiscal year began Oct. 1, double last year's figure and up fourfold from 2012. The majority of those are from Guatemala, El Salvador and Honduras, where poverty and gang violence have are prompting the flow. Honduras, for example, has a homicide rate topping 90 per 100,000 residents. Another factor is rumors -- reportedly fostered by human smugglers—that minors arriving at the U.S. border will be allowed to stay. This leads some parents already in the United States to send for children they have not seen in years. "These children leave their countries, pushed by misery, violence or a desire to reunite with parents or family members, who have already migrated, and then confront all kinds of deprivations and dangers, experience a terrible humanitarian crisis," read the letter, whose signatories included Cardinal Oscar Rodriguez Maradiaga of Tegucigalpa, president of Honduran bishops' conference, and Auxiliary Bishop Eusebio L. Elizondo of Seattle, president of the U.S. bishops' migration committee. "This dramatic situation affects all of us and we must commit ourselves to 'globalize solidarity,' recognizing, respecting and defending the life, dignity and rights of every person, independent of their migratory condition." Workers at a center for deportees in San Pedro Sula, a city with one of the world's highest homicide rates at more than 150 per 100,000 residents, say circumstances at home and a desire to reunite with family would cause many to overlook the risks of migrating. 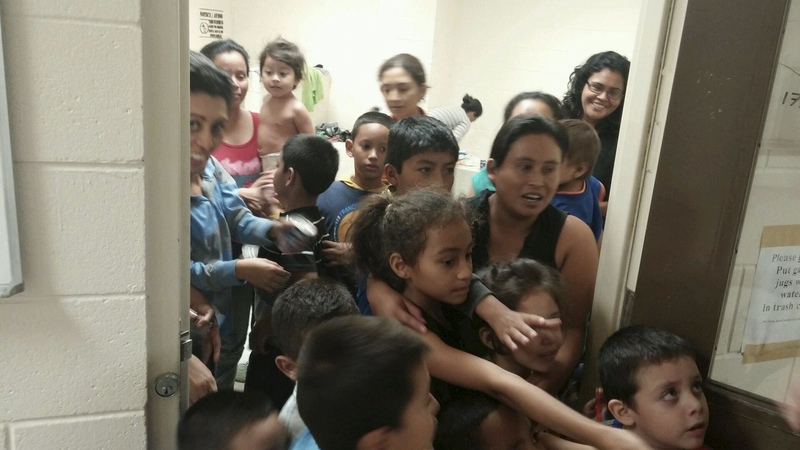 "People know the problems of Mexico," where crimes against migrants are common, said Carlos Flores Pinto, director of the northern border project for Casa Alianza (Covenant House) in San Pedro Sula. The problem, he added, is "that they are suffering more" at home. The letter said church workers would continue its efforts on behalf of migrants in all the countries involved. It also said they would continue working on development assistance, particularly for children, families and the poorest of the poor; as well as toward restoring the social fabric and offering a welcome to migrants in the church's many migrant centers. Bravo. This is where the bishops must be.